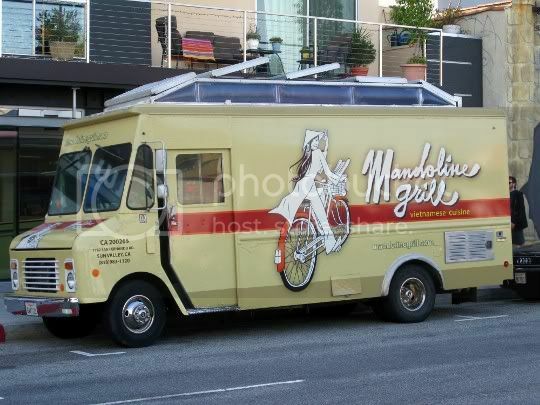 As LA's only vegan-friendly Vietnamese food truck, Mandoline Grill serves up banh mis, buns, tacos, and other goodies that are sure to keep hungry vegans following its every move. 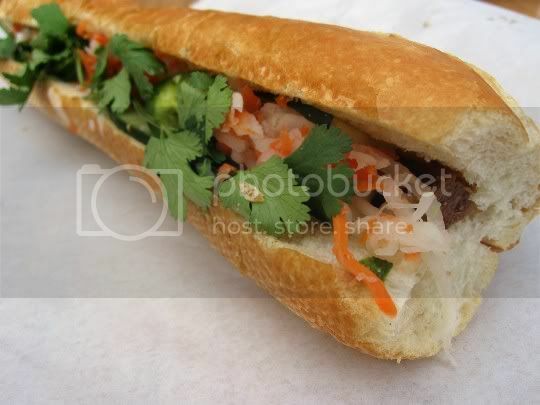 While I am particular to the banh mis of another Vietnamese food truck, the fact that Mandoline offers the only vegan version definitely allows them to stand out from the crowd. Not to mention what a sweetie the owner is! She's ready to dish out the details of each menu item, and always asks for your dietary preference. If only more trucks could follow suit! How's this for fusion? 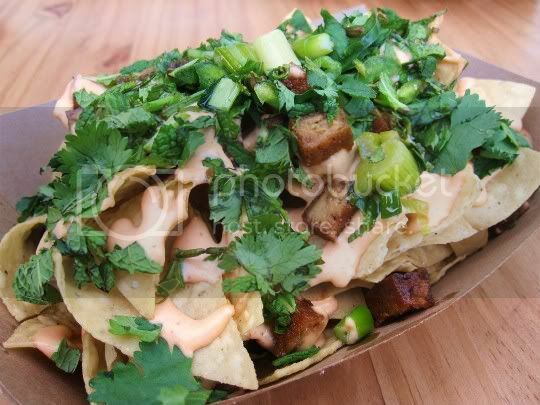 Thin, crispy salted tortilla chips topped with diced tofu, sriracha aioli, and a generous helping of scallions, fresh jalapenos, mint, and cilantro. The result? AH-MAY-ZING! I was a little reluctant to try this, as it seemed nothing more than a mass of chips and herbs. But boy was I wrong. The diced tofu is super sweet, salty, crisp, and chewy, almost reminiscent of teriyaki. The mass of greenery is pungent, spicy, and super aromatic; I usually don't like fresh mint in savory dishes, but it totally works here. And the sriracha aioli (which uses Vegenaise for the vegan version) basically acts as the nacho cheese sauce: it's salty, spicy, savory, creamy, and tangy. In one word, DELICIOUS. In fact, I wish there had been more of it on the nachos (request extra! it's that good!). In the end, I was surprised at how well all of the flavors went together. The owner did not steer me wrong when she suggested I try them, and I'll definitely be ordering them again! Okay, so I've already raved about Mandoline's tofu, which is amply featured in this foot-long sandwich (yay!). There's also the usual trimmings: cucumber slices; a mass of sweet, juicy, almost fruity-tasting pickled carrots and daikon radish; fresh cilantro; fresh jalapeno slices; mayo (or Vegenaise); and scallion oil (which I didn't really taste). I like how the "other" Vietnamese truck sprinkles their banh mis with soy sauce; however, Mandoline definitely has better-tasting and much more flavorful tofu. Unfortunately, I found the Mandoline baguette to be too thick, dry, and crusty, while the other truck uses crispier, moister, and thinner (thereby better showcasing the sandwich ingredients) bread. You can also order that delicious tofu in your choice of tacos and bun (rice noodle bowl), which include toppings similar to the banh mi. And don't forget the sriracha! Follow again? Yes...that tofu and those nachos are mindblowing!